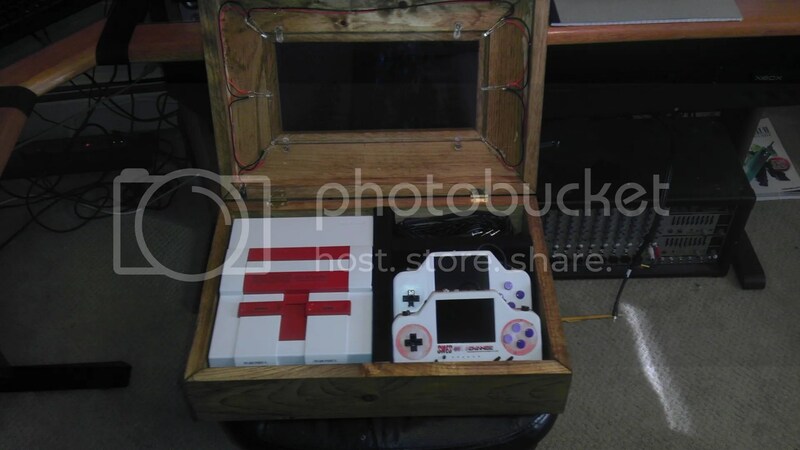 The SNES-001 Advance has a new crib to crash at! Build details can be found over on my thread at MBB, but basically we have pine box, lined with black acrylic felt, a clear sheet of LEXAN plastic, brass hinges, 4 blue LEDs and 2 White, running from an external 12V power supply. This box took probably about 8 hours or so from start to finish, but I still need to find some kind of clasp to keep the cover closed so it will hold tight. Pretty happy with this though and if you’d like to see more pics, again the build log on MBB, as well as ModRetro, Ben Heck and Racket Boy all have them for your viewing pleasure!